Siqueira M. V., Braun U. & Souza-Motta C. M. (2008) Corynespora subcylindrica sp. nov. - a new hyphomycete species from Brazil and a discussion on the taxonomy of corynespora-like genera. The new hyphomycete species Corynespora subcylindrica, isolated as an endophyte living in leaves of Lippia sidoides in Pernambuco, Brazil, is described and illustrated. The intricate generic affinity of the new species is discussed in detail, and a survey of the current taxonomy of corynespora-like genera as well as a key to the genera concerned is given. 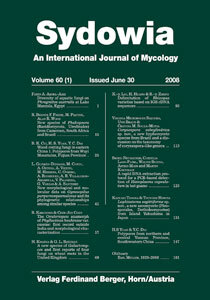 Keywords: anamorphic fungi, corynesporoid hyphomycetes, new species, South America, key.